The day did not go as planned today. We did not process fish. Michael is finishing up a Christmas project instead. The fish should stay plenty cold in the cooler on the porch. The change of plans caused me to go down the list of "weekly tasks" and pick another one for the day. One can't just dream of garden plots and moose all day. Stacia, Alex and I packed away Christmas decorations today. 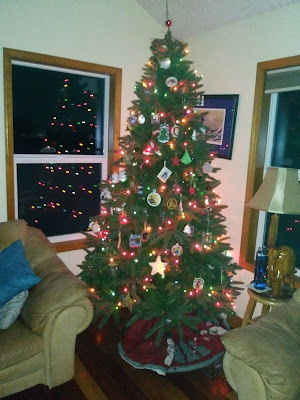 I began to ponder all that has happened since we put the decorations UP that long ago Saturday after Thanksgiving. celebrating Christ with our Life Group - life is better together. It's been a full season. A season with challenges and celebrations....with highs and lows....with family, church family, and solitude. This season reminds me once again all of life is sacred when lived in relationship with Jesus. More than all, I want to celebrate, be fully aware of, and practice the presence of God - like Brother Lawrence. And so, yes, we took down the Christmas decorations. I had a plan in mind. How many ways CAN ONE rearrange a tiny living room? Evidently, untold numbers of times. 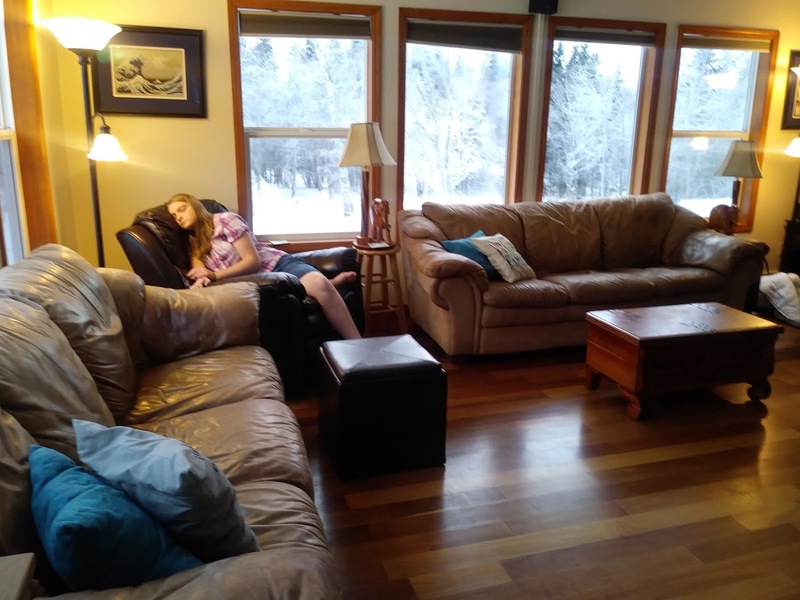 During the holiday we had to put rockers in our bedroom and shove the recliner to a new location to make room for our ever-expanding table arrangement.....we liked having the recliner moved....but it did block the electronics. 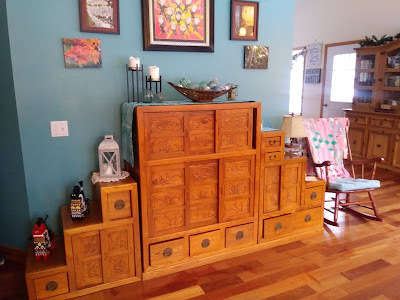 I began to think...... We usually separate the pieces of the Step Tansu and use them around our room as end tables and such. This time we left them all together. 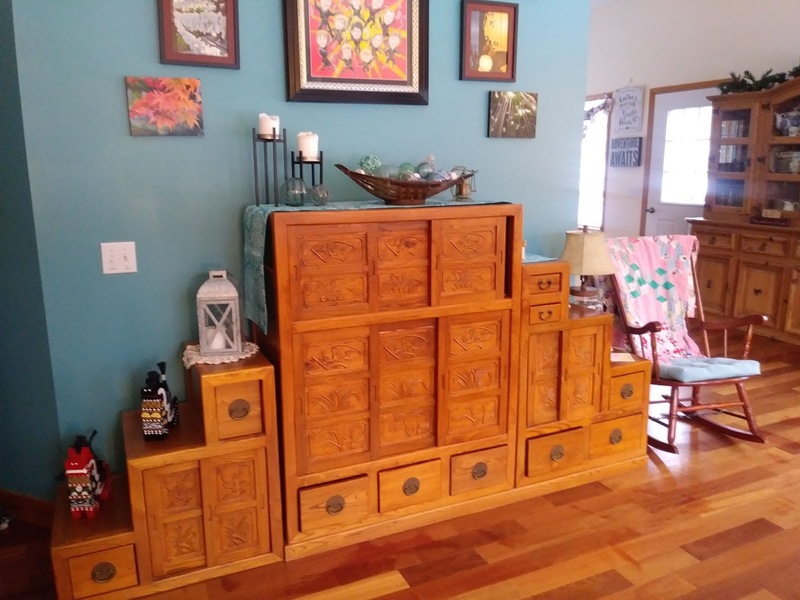 We are able to utilize the space in the tansu much easier this way. We found one piece of Christmas celebrating we've not completed. ::snort:: We'll finish and blog later.